CLARITY & EQUINIMITY (Temple Flowers) 4 oz. Flower essences awaken us with their vibrancy and joy. They provide a doorway through which we can transform patterns and cycles of sadness, depression, and confusion. Flower essences assist us in the resolve and release of emotional and physical illness through their holistic modalities of healing. 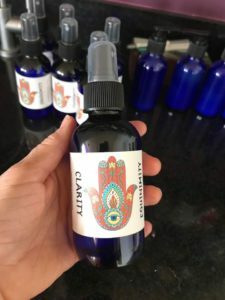 This highest quality hand-made and hand-poured gem combines five different sandalwood oils create the foundation for the Mandarin, Neroli, Clary Sage, Lemon, and other therapeutic food-gradeessential oils in this sacred essence make this an exquisite olfactory experience and especially powerful for balancing the energetic and emotional body. The final product is finished and charged with 7 small rose quartz crystals that sing when shaken. This journal was hand-made by Kimberly with the highest quality paper suitable for writing. Record your dreams, poems, musings, and heart’s desires… whether you are sitting in nature playing your drum, sitting on your porch admiring a flowering vine, or comfy in bed at the end of your day, putting your heart on paper renews one’s connection to the Self. 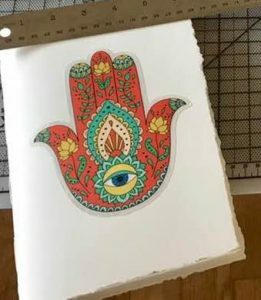 stamped with the protection of this stunning hamsa, you will be drawn to sit and contemplate your inner world, creating a refuge from the often frantic pace of daily life. 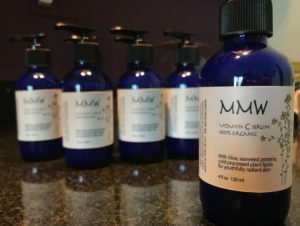 Vitamin C Serum 4 oz. The cutting edge of skin care research shows that aging skin is the result of more than just years on the calendar. Exposure to environmental elements like sunlight, smoke, and air pollution causes photo-aging in skin. Not only does this lead to the formation of lines, wrinkles, and uneven pigmentation – it can lead to more serious skin issues and problematic dermal conditions. A comprehensive topical nutrient application can help prevent photo-aging and the onset of more serious skin conditions. Topical vitamin C has now been shown to provide up to eight times the skin’s natural protection from UV damage. Vitamin C protects your skin from the sun in ways that sunscreens can’t. In conjunction with other bioavailable skin nutrients, Vitamin C can provide almost complete photo-protection – preventing photo-aging, preventing the appearance of fine lines and wrinkles, and promoting vibrant skin health. Organic sulfur enhances cellular permeability, allowing toxins to move out and nutrients to move in. It also acts as a natural healing solvent, driving nutrient rich ingredients deep into the cellular matrix. The end result is more elastic, resilient and pliable skin. This highest quality product is infused with a high percentage of Seaweed Proteins that act as collagen building precursors. Antioxidants round out the triple grand slam that is this formula. Raw cold processed plant lipids lubricate and hydrate the skin for rapid repair and moisture restoration. A wonderful daily moisturizer w Aloe helps make it a potent post-sun therapy for all skin types. Skin and body are the perfect medium for the thoughtful synergy of ingredients in this formula. For any person with skin, this is the correct product to use for celebratory results. Shine on and love the skin you are in!